Craig Bellamy will captain Cardiff City at home against Doncaster on Saturday after he was officially registered on loan from Manchester City. 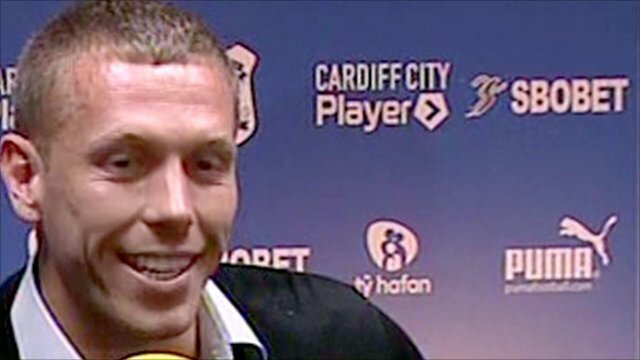 Football League chairman Greg Clarke had warned on Wednesday hey might refuse to register Bellamy because of concerns over Cardiff's finances. But Cardiff announced on Thursday that Bellamy's paperwork had gone through. And on Friday manager Dave Jones said Mark Hudson remains club captain, but added: "Craig will be team captain." A day earlier, the Bluebirds were able to announce the striker's availability following the Football League's concerns being made public. "Craig Bellamy has on Thursday... been fully registered to play in the... Championship," said a club statement. "And as a result [Bellamy] is now fully eligible to join the match-day squad for our home game against Doncaster Rovers on Saturday." Cardiff have debts estimated at £30m and have missed tax bill deadlines, leading Clarke to tell the club that they had to be able to prove they have the means to fund Bellamy's loan move to help preserve "an integrity of competition". But Cardiff chief executive Gethin Jenkins confirmed on Thursday the south Wales club has been able to alleviate any fears the Football league harboured. "We went to the League, we gave them a full explanation of how we are funding this [Bellamy's loan], the underwriting of the agreement by our Malaysian investors and we put a business case to them," Jenkins told BBC Sport Wales. "I'm disappointed that the League chairman went public. They had the right to ask questions, they are the League. "They could have asked questions of us and then said afterwards, once we'd cleared the hurdles, that we'd passed it and they were happy with what we were doing and why we were doing it, and that we were conducting ourselves in the right way. "There's been a lot of envy out there about what we've done, the fact that we've brought the Wales captain home. "People have been really questioning it but they forget that at the start of the season we released 10 players off the payroll, there's been other activity and other issues here that we've resolved. "We've faced up to our challenges when there were easier alternatives at times... we've been open and honest about that and we'll continue to be so." On Friday Jenkins told the club's website the income generated by Bellamy's arrival has already allowed them to pay Motherwell a large proportion of the outstanding £175,000 debt for Paul Quinn's January transfer. Motherwell say they received £100,000 on Friday and expect the rest by next Tuesday. Jenkins also said the Bluebirds have paid their latest HMRC tax bill on time, adding: "Awe are committed to addressing the obligations of the business and we will face up to the challenges that will come." Motherwell chief executive Leeann Dempster was earlier publically critical of Cardiff's recent signings. "They [Cardiff] have signed a high-profile player, which has really annoyed us," Dempster said this week. "They should have their debts settled from last year before they are allowed to sign any players." Cardiff failed to pay £100,000 due to the Fir Park club in January and a further £75,000 summer payment has also not been forthcoming. Motherwell issued a writ against Cardiff at Hamilton Sheriff Court a week ago, but say that the Welsh club did not attend or submit a defence. 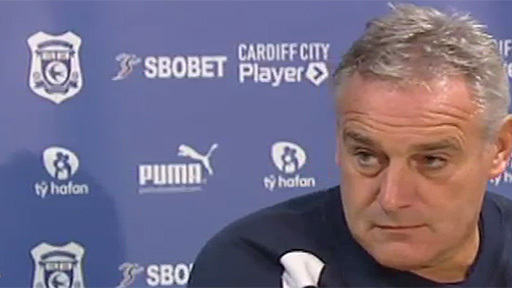 Cardiff have not spent any money up front on permanent signings this summer, relying instead on loans to bolster Dave Jones' squad since their transfer embargo was lifted earlier in August. The transfer ban was imposed due to a delay in paying debts, including £1.3m owed to HM Revenue and Customs. As well as the surprise capture of Bellamy, midfielders Jason Koumas, Seyi Olofinjana and Danny Drinkwater have all arrived for the season from Premier League teams. It is thought that Manchester City will continue to pay the bulk of Bellamy's wages, but Cardiff's combined wage bill for their new recruits will still be significant. But Cardiff have pointed out that increased ticket sales and merchandising sparked by Bellamy's signing on Tuesday will have a beneficial effect on the Championship club's finances. "We feel this deal stacks up - in a sports context obviously, but also in a business context - and so far the fans have been great in turning out and buying tickets, buying shirts which all helps to contribute towards the costs and the running of this club," Jenkins said.